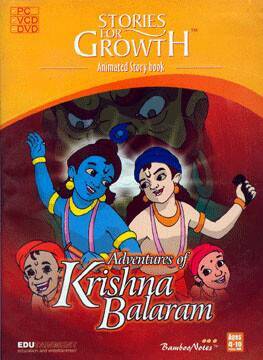 This title has seven stories from the Srimad Bhagavatam about the wonderful activities of Krishna and Balarama. The narrations are presented in a simple, interactive format with beautiful illustrations and captivating animations. There are many lessons that children can imbibe as they observe their most enduring heroes in action. This is a VCD with interactive games for children to play on a computer and a video that will play in a DVD player.